The compact of trust between companies and consumers is a bit stronger in Japan than it is in many other countries. How else can you explain that one of the biggest recent hits for Nissin, makers of Cup Noodle, is its “mystery meat” instant ramen? Yes, mystery meat was a big seller even before we found out that it’s true identity is a mixture of pork and soybeans. 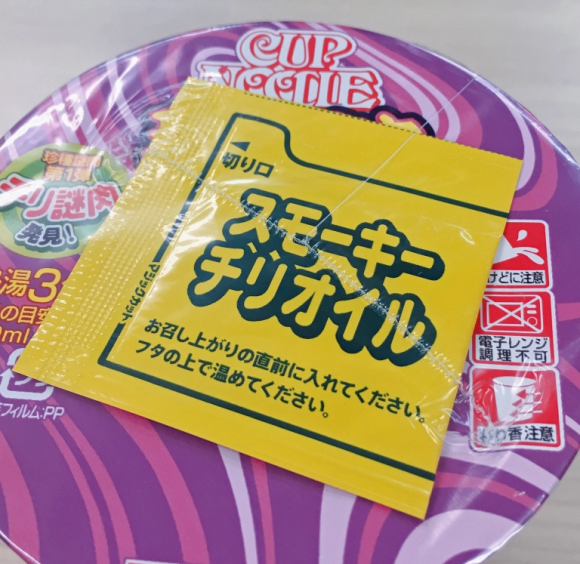 So Nissin has decided to double down on its unsettlingly vague marketing by naming its newest offering Cup Noodle Rare Species Mystery Meat. Making things even scarier is that the packaging for the new noodles is an attention-grabbing purple, which isn’t a color associated with any commonly eaten animals. If anything, it made us think of the color characters in Japanese video games turn when they get poisoned. Nevertheless, we here at SoraNew24 are fearless gourmands/too lazy to cook for ourselves, so we hopped across the street from our offices to our local branch of convenience store Lawson to pick up a pack. Taking a moment to examine the lid, we spotted a notice proudly proclaiming “The discovery of chili mystery meat!” There was also a packet of smoky chili oil, which you’re supposed to add to the broth just before you start eating. Inside, our eyes were drawn to the bright red chunks of mystery meat (once again primarily pork and soybean), which owe their color to having togarashi red pepperkneaded into them. We boiled some water, poured it in, and let the contents of the cup cook for three minutes before adding the oil. As we took a moment to snap some photos, we were surprised that the scent rising from the cup didn’t seem particularly piquant. Sure, there was a little bit of spice, but not as much as we’d expected from the meat’s colorful appearance. Taking our first bite of the rare species mystery meat confirmed what we’d suspected, that this isn’t meant to be a fiery assault on your tongue and throat. 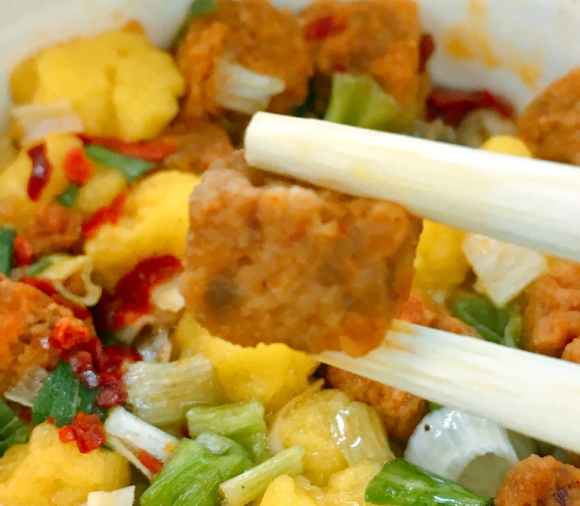 Instead, there’s a pleasant but moderate spicy kick to the taste buds, allowing you to still savor the savory meatiness of the mystery meat. 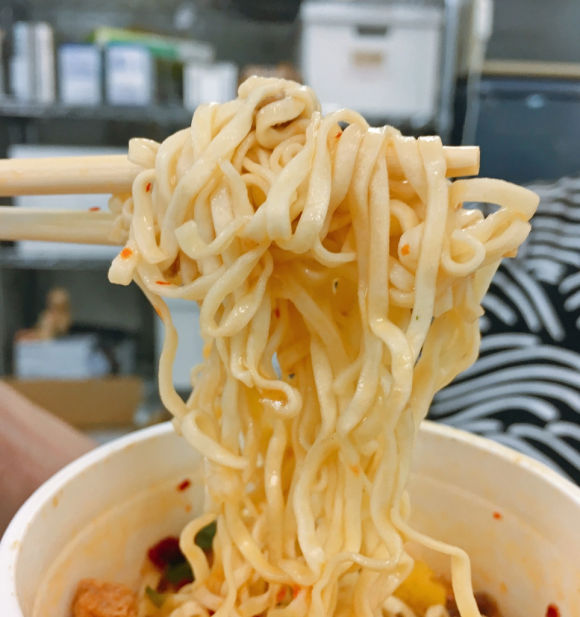 The noodles, likewise, aren’t a test of your spice endurance, being just a bit spicier than ordinary (i.e. not-spicy-at-all) soy broth ramen. But while they might not satisfy ravenous spice fiends, the Rare Species Mystery Meat Noodles are tasty enough to be worth a try, and perhaps just the thing to munch on while sitting on the beach after a long summer afternoon frolicking in the surf. 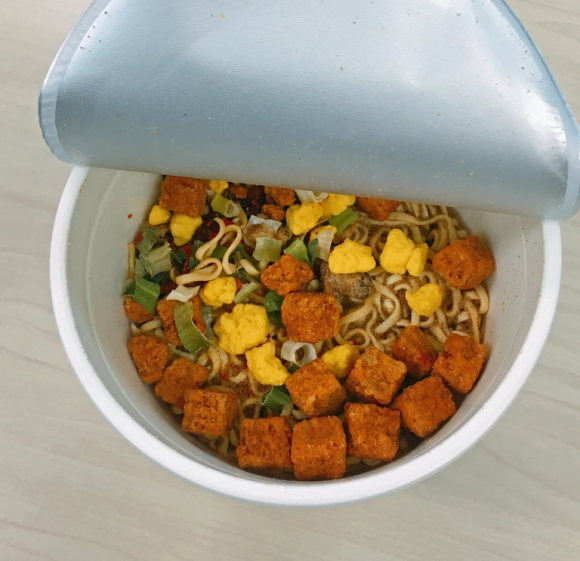 And even if they are milder in flavor than their wild name implies, Nissin has two more Rare Species Mystery Meat Cup Noodles flavors coming soon. BTW, it's not exactly a term of endearment, as most folks unfortunately call it Spam. Seafood Cup is still the best! Some interesting facts about Ramen. Also you can always pay a visit here. I have been twice and always enjoy it. Okay, Mr. Ramen Critic, now tell us: Which type of soft drink is best imbibed with mystery meat? The food is disastrous for your body and the container is disastrous for the environment. Doesn't anybody actually eat fresh food anymore? You ask most Japanese what type of meat they are eating in their dish, and they often can't tell you. Is this where some of the whale is ending up for 'scientific testing'? One of the links above has the answer. 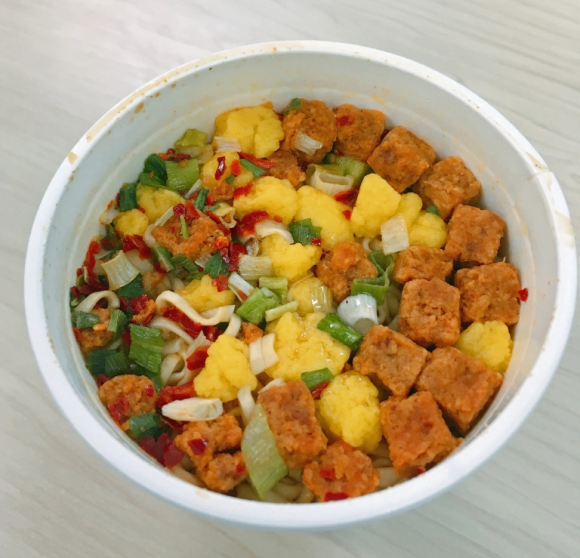 “We mix pork and soybeans together with a vegetable extract, and then freeze dry the pieces,” the forthcoming Nissin employee elaborated. This stuff is worse than McD's for your body. I often eat cup noodle on the weekend. Seafood cup is the best taste but it’s high calorie and not good for our health. I’m interested in new item. I’m trying to eat it. I'm sure most of us have their guilty pleasures that are not so healthy for us. 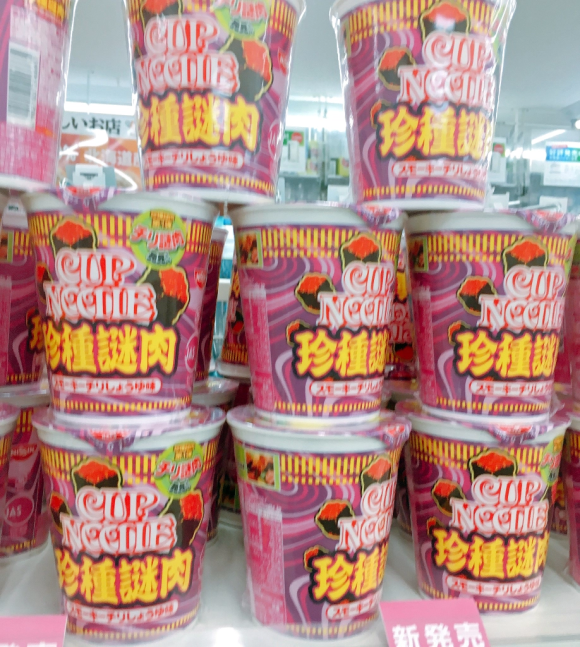 Cup noodle, never touch the stuff but I'm not a pasta person anyway. Now milk, I can drink a liter a day if wanted, and sometimes do. 1.6%.